Thank you to Jordan Bohr for writing this guest post. Jordan is a senior in Communication Studies. Have you ever tried to attach a photo to an email and discovered that it was too big to send? Take the photo using a lower resolution. Somewhere in your camera is a setting where you can specify the resolution. The lower the number that you choose, the smaller the photo will be. In many cases, something like 640 x 480 or 1024 x 768 will do just fine. If you’ve already taken the photo, use a photo editor to resize the photo. For quick and easy tasks like this, try a web-based service such as Picmonkey (www.picmonkey.com) …. simply choose Edit photo to upload it, then choose Resize from the lefthand menu. Change the width to, say, 1024 (keep proportions checkmarked) and click Apply. Click Save at the top of the screen and adjust those settings if you wish. Voila, you have a smaller photo that your email system will be happy to accept! Current Central College students and employees may now access many Geisler Library databases from a smartphone or tablet. The EBSCOhost Mobile* application (“app”) version is compatible with the Android and Apple operating systems. Supported devices include: Android, iPhone, iPad, and iPod touch. From your phone go to your App Store (Android or Apple) and install the EBSCOhost app. You then need to authenticate the app as a Central College student or employee. From a computer go to Geisler Library’s website and click on Databases A to Z.
Click on Academic Search Premier. +Access the email message from your device and click on the link found in the email to authenticate the app. (If you don’t access the key within 24 hours, you will have to generate another one by repeating steps 1 through 3). 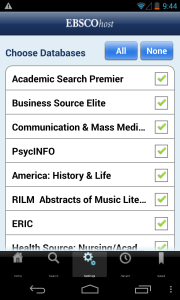 You may choose which database(s) you would like to search from the app’s Options menu, including Academic Search Premier, Business Source Complete, PsychINFO, etc. Type your search into the search (or “find”) box. If any full text articles match your search, they will be displayed in the results. Articles are in HTML text and/or PDF image. You may also save articles and searches. Unlike the Web version of EBSCOhost, an advanced search isn’t available. However, you can combine search terms with AND, OR, and NOT. If you have any questions about EBSCOhost Mobile or any other library resources, please contact one of the Geisler librarians. Contact information is available on our website – AskUs! If you haven’t already checked out Atomic Learning, be sure to add that to your to-do list. The short, “atom-sized” videos will help you learn how to use many different types of software–from Access to YouTube and hundreds of titles in between, such as SPSS and Skype. 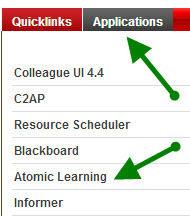 Central faculty and staff can access Atomic Learning from the righthand column on myCentral‘s home page, as shown at left. Instructors may want to assign students to watch certain tutorials as part of class homework. Make it easy for them to find the tutorials by embedding them right into your Blackboard course! Use the Atomic Learning mashup within the Build Content menu (shown at right) to search for and select the tutorials. Refer to these instructions for details. Use Firefox or Chrome instead of Internet Explorer. 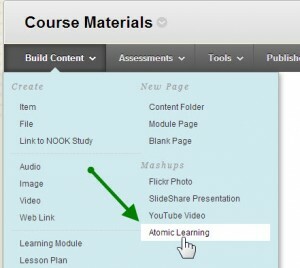 After clicking on the Atomic Learning mashup, be patient–it may take several seconds for the next page to appear. If the video does not appear, it may be because your browser is blocking pop-ups. Adjust your browser settings to allow pop-ups in Chrome and Firefox. Pass these tips along to your students. Wikipedia is now the 5th most visited website in the world (right behind heavy hitters like Google Search and Facebook). The beautiful (and sometimes horrifying) thing about Wikipedia is that anyone can contribute. Right now, you could stop reading this post, go to Wikipedia, and edit the article about long-eared hedgehogs to say that they prefer a diet of Fruit Loops and Nutella. You don’t even need an account. That kind of openness has obvious pitfalls, as any professor with a ban on Wikipedia research can attest. However, based on some personal experience, I think there are at least three reasons why professors should consider embracing rather than discouraging Wikipedia in the classroom. Although anyone can create or edit any Wikipedia article, unless new content meets some stringent guidelines of neutrality and verifiable accuracy, the changes are unlikely to last long thanks to the enforcement of fellow Wikipedia editors. The use of reputable source citations is a particular sticking point with many Wikipedia editors. I have seen new edits erased by other Wikipedia editors within seconds. The back-and-forth world behind a Wikipedia article can be found in the “View history” and “Talk” tabs at the top of every article. Take a look at these and tell me that many of Wikipedia’s articles (especially the most popular ones) are not the product of as much rigor as peer-reviewed journal articles. Interestingly and somewhat circularly, Wikipedia contains a well-balanced and informative article about its own reliability. Ok. Let’s say it is as bad as you think, at least some of the time. Sometimes it really is really bad. How would a student know? Given its popularity (you know they use it anyway), how can a student assess the credibility of information from Wikipedia? Our fabulous Central College librarians teach information literacy, including the importance of taking some information with a grain of salt. These lessons serve students well in the world of Wikipedia. Reinforcing what students have learned about critical thinking in parsing information is a great goal for just about any class, and Wikipedia provides a good platform. Students can read Wikipedia articles and verify the content with second and third sources. They can click on the “View history” and “Talk” tabs to analyze the background of an article. They can easily discover the authors and editors of articles, evaluate their online identities, and make judgments about their potential biases. At the least, Wikipedia can often be a good place to begin research on a topic, even if it is not eventually one of the sources a student cites (again, you know they do this anyway!). We can help them to use Wikipedia intelligently. It is hard to get excited about writing a paper knowing that only one person will ever read it. I felt that way as a student and students at Central seem to agree. What if lots (tons!) of people around the world read your work? Would it motivate you to do more thorough research, write with more clarity, and ultimately produce a better product? Students in my Spring 2012 Psychology of Religion class found out when they became Wikipedia editors and produced their own articles as a part of the Association for Psychological Science (APS) Wikipedia Initiative. The APS Initiative is only one of many that support professors from all disciplines to encourage their students to contribute to Wikipedia. This page contains masses of useful materials for educators who would like to design their own Wikipedia assignments (e.g., rubrics, wiki markup guides, and video tutorials). This is not to say that my Wikipedia writing assignment was perfect. There were glitches. Worries about formatting and Wikipedia style were common. Some of the more technical aspects of creating a Wikipedia article from scratch stressed some students. As the creator of the assignment, I wish I had involved the Wikipedia community at an earlier point in the writing process instead of the articles going “live” at the end of the semester. In the face of these glitches and with the opportunity to make some tweaks, would I do a Wikipedia writing assignment again? You bet. After all, pedagogical oomph for student writing is hard to come by. If you are interested in checking out the work of the Spring 2012 Psychology of Religion students, check out their Wikipedia course page. Note that the students’ articles continue to evolve – other Wikipedia editors have been busy this summer improving what the students began. It is a great example of Wikipedia in action. As the culminating activity of the Honors Program, students give a presentation of their research. Faculty, staff, students, and others are invited to attend, but scheduling conflicts often prevent them from doing so. The presentations are recorded using the Panopto lecture capture system, so those would-be attendees can watch the presentations after all. Have you ever cut and pasted text from a Microsoft Word document into a Blackboard textbox? If so, you might have been unpleasantly surprised at the result. Boy, you take one semester off for a sabbatical and crazy things end up happening in your classroom! I was away from teaching last fall, but ended up becoming a Twitter user over the fall 2011 semester, and I’ve become a big fan. So this semester, I have included my Twitter handle (name), @CentralsProfG, on all my syllabi and plan to use the service to help increase student buy-in to my courses. Twitter allows its users to categorize tweets by using hashtags. For example, in my MATH 116 class, I devised the hashtag #CentralMATH116 and will include that hashtag in any tweet I create related to my MATH 116 class. As a result, any student in my MATH 116 class can go to Twitter and do a search for #CentralMATH116 and find all posts mentioning that hashtag, and thus getting additional information about their class. I don’t really know how all of this is going to play out, so I hope to post to this blog again at some point later in the semester, reporting on how this might have helped students get more involved in my classes. We’ll just have to wait and see!! If things go well, and there is interest, I could be persuaded to post more how-to materials and instructions of how to get started with Twitter. If you’d like to read some information I found useful, you can check out a Twitter for Academics guide. Select Full Grade Center, comma-delimited and My Computer, then Submit. 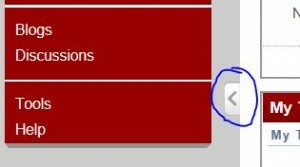 Click the Download button and choose Save. Pay attention to where you’re saving it—I’d recommend creating a special folder called Grades Archive and store all your downloaded grades in that folder. The downloaded file will be in .csv format (comma-separated values) which can be opened with Microsoft Excel. Every now and then I receive a panicked phone call that goes something like this: “I don’t know what happened, but all of a sudden the menu in my Blackboard course disappeared. How do I get it back?” This happened twice today to two different faculty members, precipitating this post. Q. How did the menu disappear? Q. How do I get the menu back where it belongs?